corrupted Partition Table file Recovery, you can retrieve your files from damaged or corrupt partition. 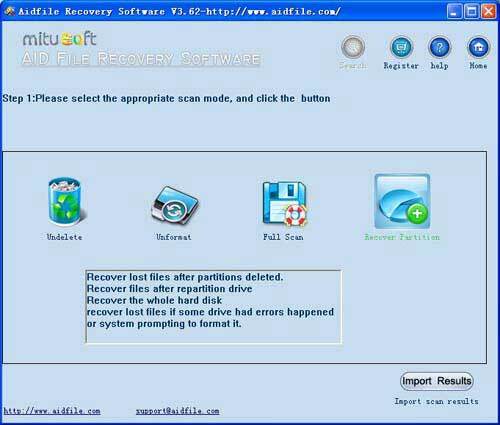 Aidfile recovery software helps you to recover partition table for saving important files. Partition can be considered as a piece of disk space, which is marked thereby runs on some operating system. Partition table is located at the first sector (cylinder 0, head 0 and sector 1, MBR) of each hard disk. It memorizes information about sizes and locations of partitions on hard disk. The partition information is started on offset 1BEH of master boot sector. Each partition entry is 16 bytes long. The total partition table is 64 bytes long. Then partition table is limited to a maximum of 4 entries. That is, there is a maximum of 4 partitions, which is called primary partition and can be created on hard disk. But there are problems: many people want to create more than 4 partitions. So the extended partition is designed for this demand. Master extended partition is the primary partition. Differing from other partitions, the first sector of extended partition is not a boot sector, but another partition table, which is called logical partition table. Commonly, there are only two partition entries in logical partition table. One points to a partition, called logical partition, whose boundary must be limited to the extended partition. The other entry, if needed, of the extended partition table points to the next logical partition table. Similarly, its boundary is limited to its parents extended partition. And the next logical partition table may also have two partition entries: one points to a logical partition; the other points to another logical partition table and the rest may be deduced by analogy. Therefore, many partitions could be created in extended partition. In short term, partition table is a table that stores the locations of all files, where they are. So once your partition table is damaged or corrupted, you may not find the files through Windows systems, or even worse, you can't access that partition neither. People usually will take partition table fixing into consideration. However, there are plenty of partition table fixing software on the market, but all of them can only rebuild the table instead of fix, which means you will get an empty partition after rebuild the table and all data in that partition will disappear. So to recover the files in partition with damaged partition table, we recommend you to use file recovery software directly. You have 100% chance to get data back. Here, Aidfile Recovery Software can meet your needs. Why not have a try? How to recover files from lost partition. 1. Select the "Recover Partition " button and select the hard drive, then click the "NEXT" button. 2. Select the partitions of the hard drive, then click the "NEXT" button.